Vaccines do work! Don’t wait…vaccinate! How Can a Parent Decide if Vaccines are Safe? Every day parents are bombarded with information from doctors, nurses, TV hosts, books and the list goes on. Parents are best served by listening to a team of experts. We must trust the health care system that has given us the tools to prevent diseases that were so prevalent in children just a few years ago. Committees of expert scientists, clinicians and health care providers serve on the CDC (Center for Disease Control and Prevention), AAP (American Academy of Pediatrics), the Infectious Diseases Society of America and other groups. These experts look at scientific studies to see if they are performed carefully, are published in reputable journals and can be reproduced. Studies that do not meet these standards are not considered reliable. These groups have pulled vaccines in the past that have been determined to have unsafe side effects or side effects that outweigh the benefit of the vaccine. The groups have also repeatedly looked at studies regarding vaccines and asthma, diabetes, multiple sclerosis, SIDS and autism. No studies have shown a reliable causal relationship between vaccines and these illnesses. Be careful what you read…be sure it is reliable! A vaccine is usually given by a shot. At this time, there is one oral vaccine for rotavirus. The vaccine contains a dead or weakened germ that will NOT cause the disease. 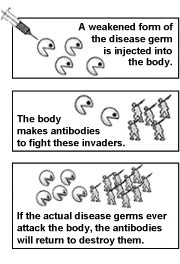 The body makes antibodies to fight the weak or dead germs in the vaccine. These antibodies practice on the weak germs so when the real strong disease germs, which are still out there, enter the child’s body the ready antibodies will know how to destroy them and the child will not become sick. Antibodies fight infectious diseases and usually stay in a person’s system even after the disease is gone to protect him or her from getting sick again–that is immunity. Newborn babies are immune to many diseases because they have antibodies from their mothers—this only lasts about a year. The timing of the vaccine schedule is such that a child will develop immunity to a disease before he or she is most vulnerable. Immunizations protect your child and the community—herd immunity. Herd immunity protects unborn children, the elderly whose immunity may have waned and babies that are not yet fully immunized. When you choose to immunize your child and follow the recommended guidelines, your child is protected from diseases that can cause death, disability, or severe illness and even though we don’t often see these diseases; they are still out there today! If your definition of safety is something that does not have any side effects–then a vaccine is not 100% safe. All vaccines have side effects, but most of them are very mild. This might include a fever, soreness, redness or swelling at the vaccine site, and fussiness. Some side effects are more severe, but these are much rarer. Some parents ask if it would be safer to avoid the vaccine and the possible side effects. This is a choice that also has side effects, ones that are much more serious. The risk of your child being infected with the disease the vaccine prevents is greater than the risk of the serious side effects. I Never See These Diseases, Why Get a Vaccine? Many of the diseases that vaccines prevent are common. Pertussis or whooping cough is a very common disease that if your child is not immunized against–they are very likely to become ill with the disease. This is a serious disease especially in infants and the elderly. Last year in the Indianapolis area, there were large pockets of whooping cough outbreaks in several schools. Many of the diseases could become common again. H-flu diseases such as meningitis and measles mumps and rubella have all “popped up” in areas where the immunization rates have fallen. A measles outbreak in the Indianapolis area during the Super Bowl a few winters ago and a more recent outbreak beginning in Disneyland both demonstrated how contagious this disease is and how quickly the disease can spread among children and adults who are not fully immunized. Some diseases such as polio and diphtheria have essentially been eliminated from this country, but still occur in other countries. We are a small world with many people traveling internationally; your child can be exposed to these diseases by traveling or by people who have entered this country. Following the recommended immunization schedule is one of the best decisions you can make for your child’s health. Don’t wait, vaccinate!